Breaking stress is the maximum stress that the body can withstand before it finally breaks. It is defined as the ratio of braking force per unit area. It depends on the nature of the material but it is independent of the physical dimensions of the body like area and the length of the body. Braking force can be defined as breaking stress multiplied with area. The braking force depends not only on the nature of the material but also on the area of the cross-section of the material. So if you cut your wire to half of its original length, it is breaking stress remain same and even the braking force also remains the same. If you cut the wire to half of its thickness, the breaking stress of the wire remains same but the braking force will be reduced to half. It is quite possible that a very long wire due to its own weight can get the braking force and break. This particular Length is called braking length. While writing a equation for this, in the place of the weight we have to write mass of the body multiplied by the acceleration due to gravity. Basing on this concept we can read the equation further braking length of a wire as shown in the diagram below. We can also calculate the increase in the length of the wire due to its own weight when the wire is not breaking. 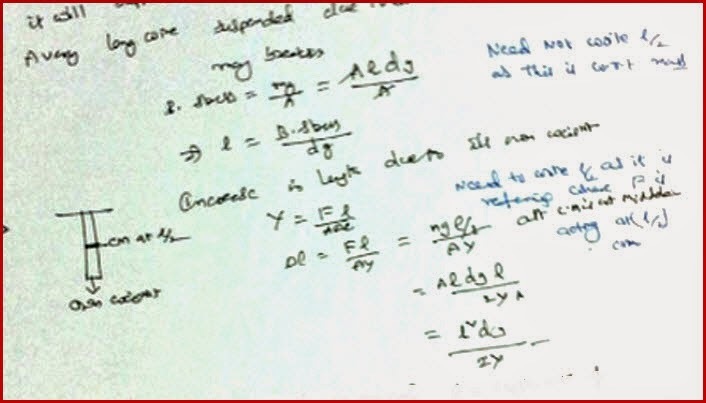 While solving this problem we shall consider that the entire mass of the wire is concentrated at the centre of the mass of the body and hence while calculating the length that we have to take only half of the length of the wire.The derivation for this is also shown in the above diagram. Elastic fatigue is the phenomenon of the temporary loss of the elastic property due to the continuous application of the force on a body.Basing on this property by applying a force on a wire continuously at a particular point we can actually break it without cutting it. The length of a metal wire at tention T1 is L1 and its length is L2 for a tension T2. Find the original length of the wire when no forces applied on it? 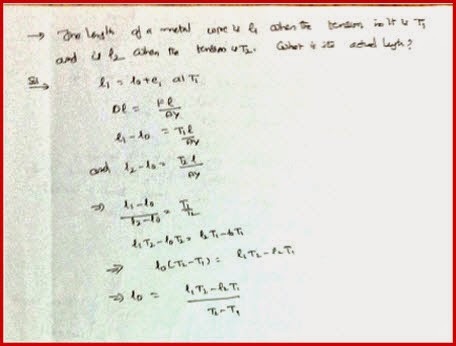 As the given lengths of the wire when a particular forces applied, we can consider L1 as original length plus some extra length. The same can be applied in the 2nd case also in the problem can be solved as shown below.